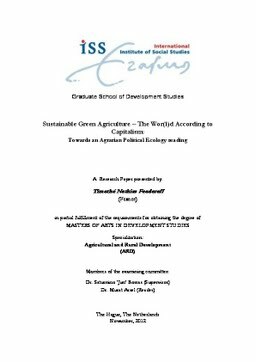 This research paper is about disentangling, in the shadow of contemporary capitalist forces dynamics, the politics of socio and ecological patterns of agrarian transformation à la Sustainable Green Agriculture, the new agri-environment paradigm promoted by international agencies for agricultural and rural development. Exploring this paradigm through an Agrarian Political Ecology, it aims at developing a socio-agriecological regime lens for defining the context of the dynamics of the current capitalist framework and then investigate the location of the proposal within it. The research finds in Sustainable Green Agriculture mechanisms of mind and material accumulation by dispossession, where particular framing of the problem and the fallout solutions are biased towards enhancing capitalist approach of rural development. This paper is relevant to Development Studies as the research investigates reports issued by agencies from international development circle. As those policy statements might influence the social realities is many part of the world, yet the significance of critically analysing them.